There were plenty of books to review. Almost as soon as I turned in a review, another book would be available. (As with many Book Reviewer gigs, you keep your free review copy.) And after you’ve been reviewing for awhile — say after 8-10 reviews — you can ask for a raise. If you’ve been hitting your deadlines — reviews are due two weeks after assignment — and the indie title flow is good, and your reviews don’t need a lot of editing, you may get it. For examples of Indie book reviews, click here. If you have some experience reviewing books, you can find the Kirkus job here. Online Book Club — The OBC advertises a range of $5-$60 per review (400 word minimum). You don’t need a particular background, just a love of books and the willingness to write honest reviews. “The first review you do will not be paid. This acts as a trial run to make sure you can write a review that adheres to the Review Team Guidelines…” Details here. 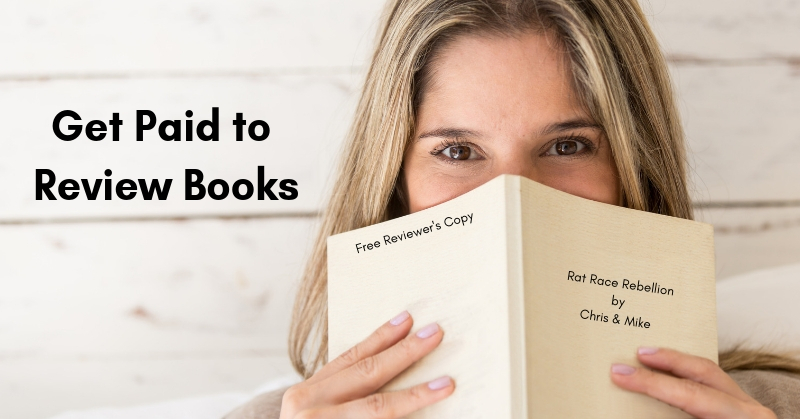 US Review of Books — This site publishes reviews in 75+ genres, including Romance, Women’s Fiction, Parenting/Families, Horror, Erotica, Humor and many more. Book titles are posted for potential reviewers to choose. Reviews typically run 250-300 words, and are due 2-3 weeks after the book is assigned. The amount of pay isn’t specified, but per the site, “Reviewers are paid monthly for every review completed during the previous month. Checks are sent by the 5th day of each month.” For more, click here. For now, they want reviews in the following categories. If none suits, check back on their job board (you can also set up an email alert there) because their lists change. “Book enthusiasts with an education and a background in specific areas preferred, although newcomers are always welcome,” they add. More Book Reviewer options below. And for more side gig ideas, here are 10 Online Side Gigs You Can Do Now. BookLook Bloggers — This site — part of HarperCollins Christian Publishing — pays in free books (you keep the one you reviewed, though as I’ve said that’s not an unusual arrangement). “Read the book and craft a 200+ word review. The review can be positive or negative, it just needs to be based on the entire book. Post your review on your blog [you’ll need a blog with at least 30 followers] and any consumer retail website (Amazon.com, barnesandnoble.com…)…” Details here. NetGalley — Another option for reviews is NetGalley. There’s no payment, but the galleys (a pre-publication book format) are free, and you can also strike up relationships with publishers — never a bad thing for reviewers. “NetGalley is an innovative and easy-to-use online service and connection point for book publishers, reviewers, media, librarians, booksellers, bloggers and educators. NetGalley delivers digital galleys, often called advance reading copies, or ARCs, to professional readers and helps promote new and upcoming titles. Professional readers — reviewers, media, journalists, bloggers, librarians, booksellers and educators — can join and use NetGalley at no cost.” For more, click here. For more jobs like these, see our Newest Jobs & Gigs page. To be the first to hear about jobs we post, like our Facebook page and check your feed. Happy Reviewing!